AirRouter-HP is end of life (EOL). Ubiquiti recommends ACB-AC for functional replacement. Introducing AirRouter-HP, Ubiquiti's high-power, indoor commercial WiFi Router featuring powerful airOS™ features. Capable of connecting over 100 meters away at 150 Mbps speeds. 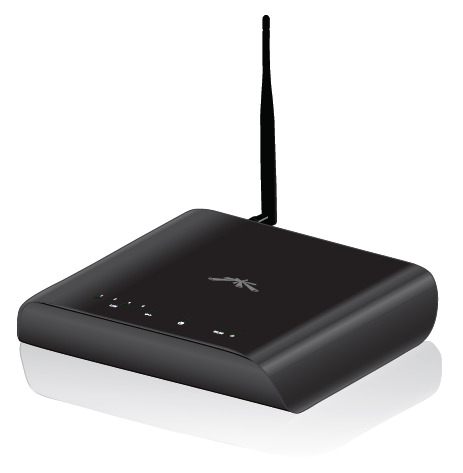 AirRouter-HP features 5 X 10/100 BASE-TX (Cat 5, RJ-45) Ethernet Ports, USB Port and integrated antenna. AirRouter-HP utilizes Ubiquiti's airOS™ which builds upon the market leading intuitive user-interface loaded with advanced wireless configurations and routing functionality. The AirRouter-HP 802.11n Wireless Router is a multi-purpose router that can act as a standard SOHO (Small Office/Home Office) router or operate in two other network modes: Bridge or Router mode. The AirRouter-HP also offers multiple wireless modes including Station mode to extend your wireless network and Access Point mode to function as the center of your wireless network. The AirRouter-HP offers channel shifting, a proprietary Ubiquiti feature that allows you to offset your channels from standard 802.11n channels. Your network benefits by being private and secure for your users while making it invisible to millions of unwanted subscribers. The AirRouter-HP also supports airMAX which allows you to connect other Ubiquiti airMAX devices at higher performance rates.